fCoder SIA. 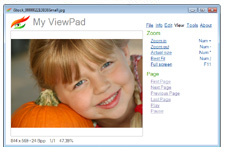 presents a new version of our high quality product, My ViewPad image viewer. informative right click menu allows to instantly perform actions without wasting time on searching for the needed function. My ViewPad is free image viewer that can be used both as stand alone application and as TotalCommander plugin. Why users should use this product? Because it is the best free viewer of digital graphics. Over several years of working on a graphics engine our company created a truly stable, quality product. It is likely that My ViewPad uses the best digital graphics engine that is available on the market. Judge for yourself. If you haven't noticed anything special, we reached our goal. That means that the program is doing what it is supposed to do - it is showing images. If your program is so excellent, why is it free? Some time ago people had to pay for things that are given out for free now. The same trend applies to the programming applications. If you have to pay for a digital graphics viewer, that's called anachronism. Since My ViewPad is free, how do your programmers get paid? Our company was founded before all the dotcom boomers and continues to prosper by creating and selling programming applications. My ViewPad is not a commercial product. It was created for our company's internal use. Today we offer it to you as a result of progress in digital technologies. Take this quality product and use it freely as we do. How many file formats are supported by your program? The answer to this question depends on what you consider a separate format. Some software manufacturers are after a big number. If we use their method of counting file formats, we will end up with over 100 types that we support. In what ways is My ViewPad better than other viewing programs, leaders of the market, whether free or not? Not in much except for quality. My ViewPad can view large images; it can show thousands of images in a row; it can view files with errors and nonstandard formatting, as well as multi-page and animated files. All of this was tested over and over. We have a huge collection of various digital graphic files that could not be viewed by other programs. These different files came from our customers and were collected over many years. Each such file presented a real challenge for people and that's why we ended up with files that no one could view anywhere else. Of course, you could have a file like that yourself. In this modern age of digital information it's impossible to avoid minor troubles. To keep up with progress means not only updating your anti-virus database. Our tests show that other popular viewers can't view even a half of our file collection. However, we can! And we are happy to tell you about it. If I've got a file that your program can't view, what then? It is possible, since there are no ideal solutions. In this case send us your file, as our customers did, and most likely that soon you'll be able to view it. Some people get so used to their favorite file viewer that they never want to switch to anything else. That's great that these people found a programs that satisfies all of their needs. Consistency is a good thing. To my regret, in this case our program is not for them. I see a number of faults in your program. Can you explain that? We are sure of one thing - the quality of the viewer. Try to disprove that. As for the rest, you are probably right, since My ViewPad is not a commercial product. I suggest you to write to us about our faults and we will give them our attention as soon as we can. What guarantee do I have, installing My ViewPad on my computer? We offer no warranties. In this age of lawsuits you shouldn't seek protection from us, and we have to protect ourselves. OK, I downloaded My ViewPad . What's next? Next, use it to your heart's content. If you have comments or suggestions, write to us and we will reply to you the best we can. If everything is great, write also. Nothing is as rewarding for programmers, as customer's praise for the quality of their work .